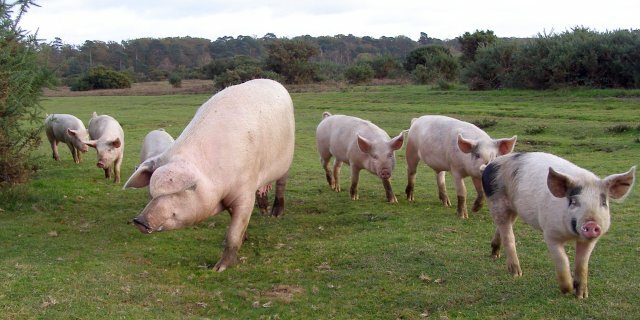 Pigs are allowed out onto the open Forest during the "pannage" season (always in the autumn, ending on 26 November this year, 2006) in order to eat the acorns which could prove fatal to the ponies. Rooting by the pigs could cause damage to the Forest so they must be inspected and ringed, and a marking fee paid, before they are allowed onto the Crown lands. The pigs have their noses up in this photo as there is not much for them to eat on this grassy strip between Ober Water and the Black Knowl heathland. This page has been viewed about 3199 times.